Losing a loved one to negligence leaves the survivors to deal with grief and often financial hardship. This unexpected loss also creates many questions. At Law Offices of Joseph A. Morrey, we've got answers for you and your family. Here are some of the most common questions people have when they first come to us after losing a loved one to wrongful death. Eligible family members may make a wrongful death claim against negligent parties. These family members include the deceased's spouse, children, parents, siblings or a court-appointed personal representative. What is the statute of limitations in Missouri? The statute of limitation in Missouri is three years. This means that you have three years in which to file a civil suit for damages against a negligent party. You can recover several types of damages, including medical bills, funeral expenses, wage loss, future wage loss, pain and suffering your loved one experienced, lack of consortium and loss of companionship for family members. An experienced attorney can make sure your case includes seeking damages for all possible losses. The attorney can review any settlement offers received, keep you informed of your options and negotiate with the other party's insurance company on your behalf. Get The Experienced Help You Need Today. Call Joe. 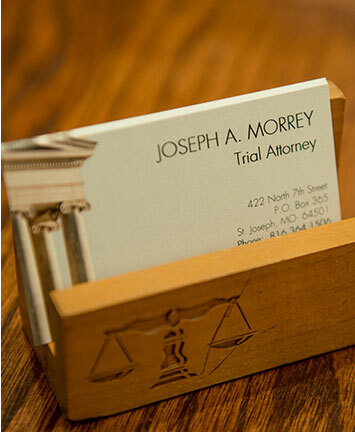 Joseph A. Morrey is an attorney in Saint Joseph with over 35 years of experience handling serious injury and wrongful death cases. Speak with him today about your loss. Call our Missouri wrongful death lawyer at 816-364-1506 to schedule a free initial consultation. You can also reach him through email.